Wonderful teacher for 15 years!!! Atma has been amazing positive influence on my life through her yoga teachings and her spiritual attunment. When I began taking classes with her many years ago, I was seeking the meditation component of yoga and expected to need to look far and wide to find such a teacher… Atma lived in my neighborhood and was already present to me, yet I had no idea what her spiritual orientation or professional focus was due to her white clothing. In a short time I came to trust and accept her teachings that weresomewhat different in language but were not in conflict with my belief system. To the contrary her guidance was what I had been seeking. During my bout with cancer 14 years ago, Atma was most willing to enlarge the relationship to include dietary recommendations and specific meditations for healing. I was abundantly thankful for her! Now, I am comfortable with my own daily yoga and meditation and remain forever grateful for her teachings. Atma is a superb teacher. On every level, body, mind and spirit. I had my first class with her about 20 years ago and I recommend the experience of studying with her to anyone. Atma’s class is always very balanced, we work hard an rest easy. Sheis very open and helpful with modifications. She is a great motivator but always wants you to listen to your body and what is right for you, individually. I always leave feeling more relaxed and centered. 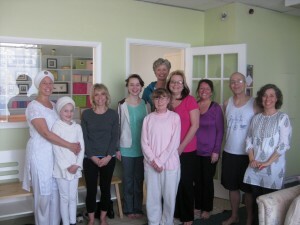 I love the combination of elements that Kundalini offers and Atma is very authentic and welcoming. Atma brings a wealth of knowledge and experience to her yoga with children. She truly understands how to combine technique with the spiritual aspect of her craft. She offered a unique experience to our students for many years. Atma is a WONDERFUL teacher of Kundalini Yoga as taught by Yogi Bhajan. She is very knowledgable and caring. Atma takes the tiem to explain all of the mechanics of the exercises-from physical to spiritual. It is because of her great teaching that I decided to become a certified Kundalini teacher myself. I still enjoy taking her classes! Atma – The Long Time Sun. The Long Time Sun is a song we sing at the end of the class. This is a good description of my Kundalini Yoga Teacher of over twenty years. She is the sunshine that warms a heart and soul. No matter how stressed out or terrible the day has been, no matter how hard it was to pull myself into class, she always puts a smile on me. When I leave class I usually end up telling her or myself that this was exactly what I needed, whether it was a good physical workout or something to lighten a heavy attitude. When I first began these teachings I would sit in the back of the class and giggle because I thought it was cute, I kept going back because I slept better than ever and never realized I would still be doing these classes 20 years later. These teachings have helped me to realize my worth and potential inside and out. The classes are suited for the beginner student or someone who has gone for years all the same. Even when I have had some physical challenges with my knees, I could still benefit from these classes. Alternate suggestion were given for postures that might be taxing. You owe it to yourself to give Atma & Kundalini Yoga the opportunity to expand your awareness of yourself. Warning: This class can be addicting! This is a place that I always come away from feeling centered and connected to the spirit of yoga. Atma is a compassionate yogi and lives her life in that way. Atma is a very special being who I have had the pleasure to know and practice with for 8 years. She is very knowledgeable concerning Kundalini Yoga and its effect on the body and spirit. I feel privileged to be in her presence and have benefited immensely from doing so. I highly recommend Atma Kaur Khalsa. We are very blessed to have Atma Kaur as a Yoga teacher in the Peninsula. She brings us the marvels of Kundalini Yoga as taught by Yogi Bhajan. 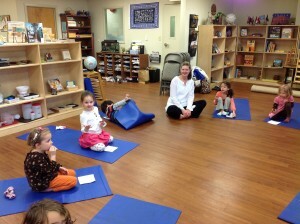 She is extremely knowledgeable and we can feel that yoga is a way of life for her. Learning Kundalini yoga with Atma is at the same time very interesting and fun. I highly recommend learning with Atma !